What happens when Travel meets horror? Are you ready to spend a day in the company of ghosts ’? Iam sure many of us have heard about the presence of supernatural powers and ghosts at Bhangarh. The fort, finds mention among the top 10 haunted places in India. In fact, many documentaries and researchers have claimed to observe paranormal activities inside and around Bhangarh Fort. Probably the reason why tourists are not allowed to enter the place before sunrise and after sunset. Yes I agree we live with the ghosts. 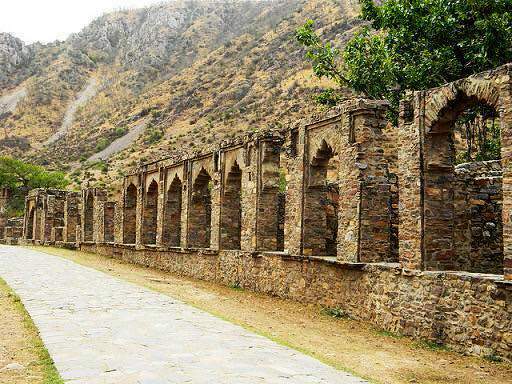 I have always believed that there are 7 billion ghosts on this planet, so what make Bhangarh ‘ghosts’ so special? I will tell you the reason; they don’t exist in the form like these 7 billion exist, whom we can see. I should admit here that though the horror has never excited me, still I have always believed to experience the unique fascination which the nature has manifested for us in many ways. And if we term one such fascination as ‘Haunted’, the traveler in me is ready to take up the challenge to face it. So while I packed my bags and got geared up to be in the company of the ‘haunted’, I also did my share of preparations beforehand which included taking along the candles, matchsticks and a torch. After all, who knows I might have got lucky to get the company of ‘mighty’ ghosts and witness ‘ghumnaam hai koi‘ moment, walking along with the candle in hand 😀 But little did I realize it was a movie song made for people to earn money. I was so much disappointed when no ghost turned up that I even fancied a ghost act and tried scaring a little dog. I swear, I never saw a dog laughing this mad before!!! Bhangarh Fort is situated on a hillside in the deserted town of Bhangarh, Rajasthan, which is a ruined town between Jaipur and Alwar. It is located at the edge of Sariska Tiger Reserve. Many legends are associated with this haunted beauty and broken down in many ways, in order to unravel the mystery of ‘Bhangarh ka kila’. 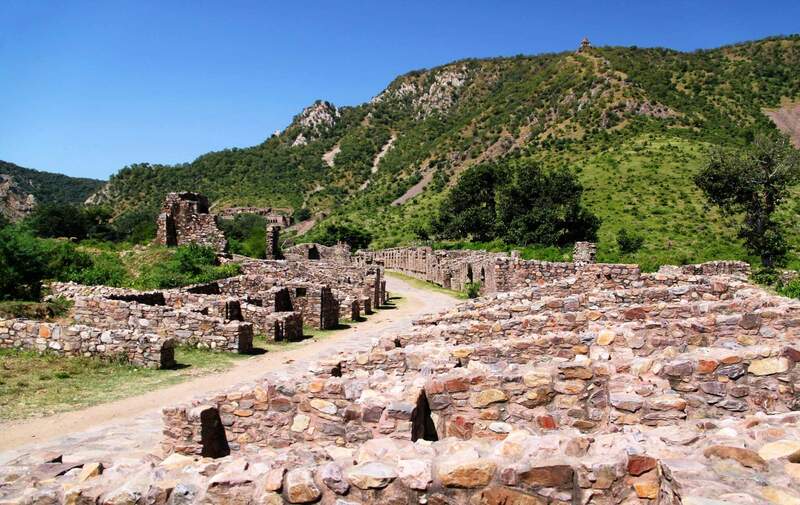 One such myth is that the city of Bhangarh was built by King Madho Singh after getting an approval from ascetic, Guru Balu Nath, who used to meditate there. Guru Balu Nath sanctioned the establishment of the town but said: The moment the shadow of your palace touches me you are undone. The city shall be no more! But one of the ambitious descendants raised the palace to such a height that it cast a shadow on Balu Nath’s forbidden retreat and his prophecy became true as predicted. The whole town was devastated. Local villagers say that whenever a house is built there its roof collapses. People also say that nobody returned who stayed there after dark. 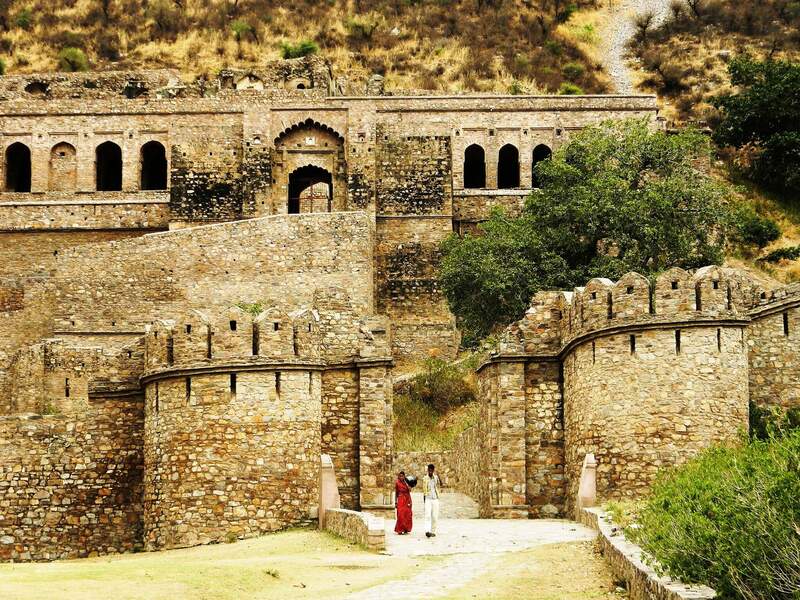 There is another, more well-known legend which says that the downfall of Bhangarh has to do with its princess, Ratnavati. She was very beautiful, and when she turned 18, marriage proposals started pouring from nearby regions’ nobility. A magician, who lived on the hill, too eyed the princess, but knowing he had little chance, he decided to cast a spell on her by using black magic on a vial of oil that her maid had bought from the market below the palace. The princess however suspected his act, and threw the vial of oil. As the oil touched the ground, it turned into a boulder of stone and crushed the magician. The dying tantric cursed the palace and all who dwelt in it. The princess died in a battle the following year, and the town perished. My first impression about the place was ‘Wait…are you sure they said haunted place/ghosts and not fairies? Because the story and tales from villagers sounded more horrifying than the fort. What I observed and felt about the place was not the ‘haunted’ fort but a ruined property, which can be an ideal location for people who want to relax themselves amidst the calmness of nature. 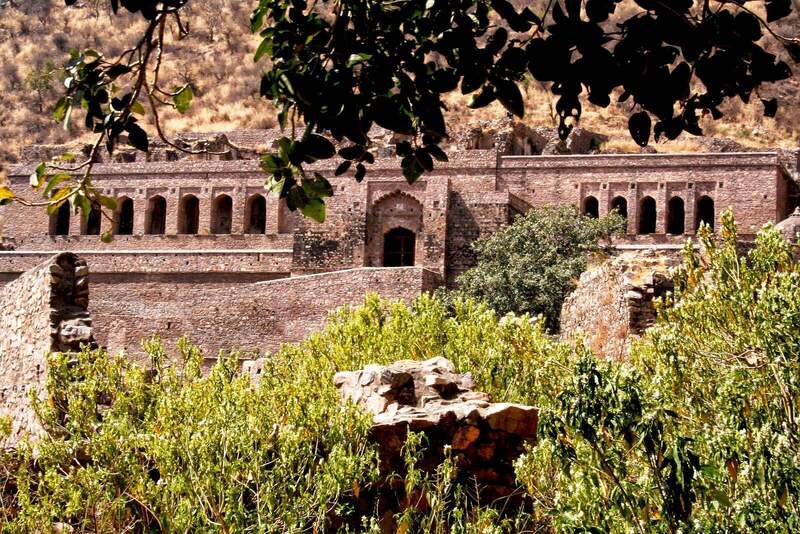 Sitting at the base of Aravali hills, and surrounded by the range all around the fort, Bhangarh Fort can be perfect get-away from the otherwise noisy and touristy places, providing the utter peace away from the modern city life. It might be renowned for its haunted and spooky presence but it can be visited as the place which is beautiful and tranquil. A place where you can opt to go for thrill and come back with peace…. In the end I only want to say that we all have passed through a stage, where in life our parents, our neighbours, our friends told us about the various ‘types’ of ghosts in this world, which are even categorised as a ‘good ghost’ and a ‘bad ghost’. And I kept on adding it into the memory! I have never experienced these ghosty moments in my life and precisely the reason why I took this trip to Bhangarh. But many years down the lane a grown up me wished everyday that rather than ‘good ghost and bad ghost’, we should have been taught about ‘good human and bad human’. May be it could have solved too many a problems all through this life! ← Learnings from a Sunset !!! Good account. I too found it beautiful, calm and peaceful, not really haunted, as expected…. Son did you finds any ghosts?